For keen walkers who don't mind going over a bit of rough ground, visit North Strone stone circle. About ½ a mile east of Alford follow the winding road to the left (south) passing Balfluig Castle. Take the first turning left at Little Endovie. North Strone is a couple fields up the hill on your left on the shoulder of the hill. Ask permission at farm to see the circle, which is in a clearing among tall dense thickets of broom. This strange circle has a low quartz recumbent stone to the south. Sixteen low irregular red granite stones make up the rest of the circle, all but four toppled. Excavation last century revealed seven graves within the circle, which is untypical of recumbent stone circles with its many small stones. A very similar circle is at Chapel o' Sink near Kemnay. The view from here is superb over to Bennachie and the Howe of Alford. 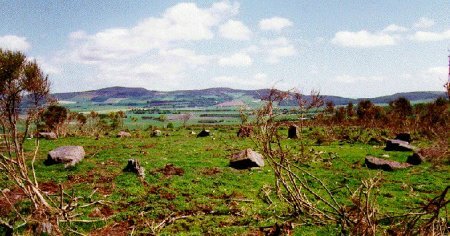 The circle at Old Keig can be seen four miles away on a clear day.